Experts and mothers alike say labor is like running a marathon, with the only difference is that marathon runners actually get to rehydrate along the way. Who would run a marathon if only ice chips were offered every so often? But until recently, that’s all we’ve allowed laboring women – ice chips – and this causes serious discomfort for most of them. Experts have restricted food and fluids on worries that a woman in labor may need a cesarean section surgery. With such surgery would come the risk she could aspirate – a process wherein the contents of your stomach enter your lungs. 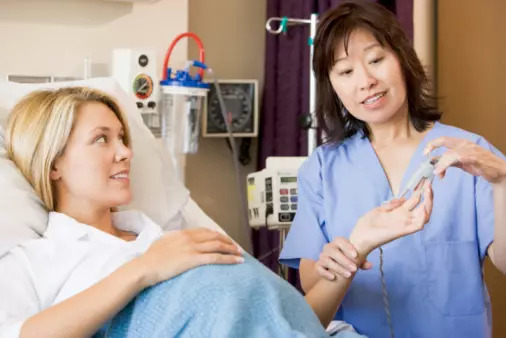 Now the thinking on drinking during labor is changing thanks to a recent recommendation from the American College of Obstetricians and Gynecologists (ACOG) who have noticed that recent advances in anesthesia used in labor have decreased the incidence of aspiration. In fall 2009, ACOG released a new opinion saying that for moms with a normal, uncomplicated labor, drinking a modest amount of clear liquids is OK.
For you, that means you can ask for water, clear tea, black coffee, sports drinks or fruit juices without pulp. But if you’re obese, have diabetes or if you are at risk for needing assistance with the birth, ask your healthcare provider if drinking during labor is an option for you because these factors increase your risk for aspiration in a c-section. ACOG recommends that these types of cases have to be individually evaluated. However, the new opinion is silent regarding how this changes if you have an epidural during labor. If you’re planning to birth your baby after a normal pregnancy via c-section, ACOG is also saying it’s OK to drink clear liquids up to two hours before your surgery. But you still need to avoid food for six to eight hours before surgery. What may complicate your request in the hospital is whether the anesthesia department also allows this as they have their own rules and guidelines for fluids prior to a c-section. Ask your provider or your hospital’s anesthesiology staff requirements exist for you. Discussing this question and others will help you know what to expect when the time comes for your baby’s birth, and you’re thirsty!